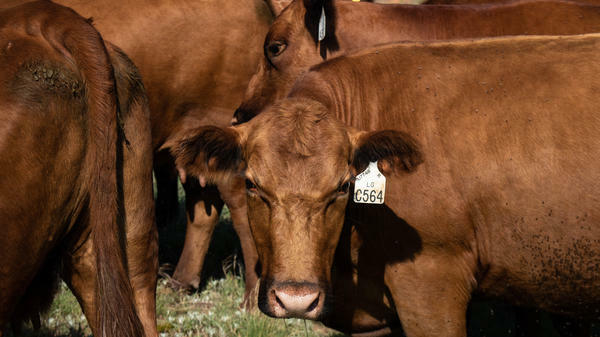 Benji and Lori White check on a small herd of Red Angus at their ranch, B&L Red Angus, near Putnam, Okla.
A small herd waits for a handout of cattle cake — a high-protein food pellet — at B&L Red Angus. The American West appears to be moving east. New research shows the line on the map that divides the North American continent into arid Western regions and humid Eastern regions is shifting, with profound implications for American agriculture. In western Oklahoma, farmers like Benji White and his wife, Lori, have become ranchers. The Whites run 550 head on about 5,000 acres at B&L Red Angus, the family's seedstock and commercial ranching outfit near the town of Putnam in western Oklahoma. The Whites used to grow wheat and other grains, but they've stopped farming to expand the ranching business. "Farming is kind of a one-shot deal," said Benji White. "If you don't get rain, where we're completely dry-land, you lose everything. Crop insurance doesn't really pay for all the expenses." Scientists say this shift — from grains to cattle and turning cropland into rangeland — could happen a lot more often. "It's just a steady progression over the last 30-something years," said Richard Seager, a climate scientist and professor at Columbia University who led new research on the 100th meridian. The findings, which were published this spring in the journal Earth Interactions, confirm an idea introduced by John Wesley Powell in the 19th century. Powell suggested the imaginary map line — which runs north from Mexico through Oklahoma and the Great Plains to the Canadian province of Manitoba on its way to the North Pole — illustrates a climate boundary that has influenced how and where people live and work. Powell, a soldier, scientist and explorer mythologized in American history for leading fearless explorations down the Colorado and Green rivers, was the first to describe an arid-humid continental split created as the Rocky Mountains block moisture from the Pacific Ocean in the West and moisture from the Gulf of Mexico and winter storms in the Atlantic soaks the East. These environmental conditions have had a quantifiable effect on human development, a phenomenon known as "psychogeography," which Seager's team confirmed by compiling data on farms, crops and climate. The research found the 100th meridian long marked a divide that predicted smaller farms in wetter Eastern states, which often depended on thirsty crops like corn, and wheat and rangeland-focused agricultural operations that had to grow larger to maintain profitability in arid Western states. Additional research by Seager's team also suggests the arid-humid boundary is moving east. "That's partly because of rising temperature, which increases the amount of moisture the atmosphere can take out of the surface, but it's also part because of projections of declining winter precipitation in the Southwest," Seager said. The west-to-east movement of this boundary, which Seager says is now likely closer to the 98th meridian, could predict profound changes in farming, ranching and the agricultural economy, including more wheat and less corn, and expensive irrigation in Eastern states. "It might require farms to get bigger as aridity increases and land productivity declines," he said. Seager warns government could be slow to address the climate shift, which could lead to more fights over water in Eastern states, shortages of crops used for biofuels, and economic problems stemming from subsidizing crops that are less viable. "In 2030, 2035 it's not going to be the same climate, and what can be grown might require some adjustment," he said. "Some of that can be anticipated because we have reasonable confidence in these projections of climate change." Many farmers, however, might not be able to afford to adapt. 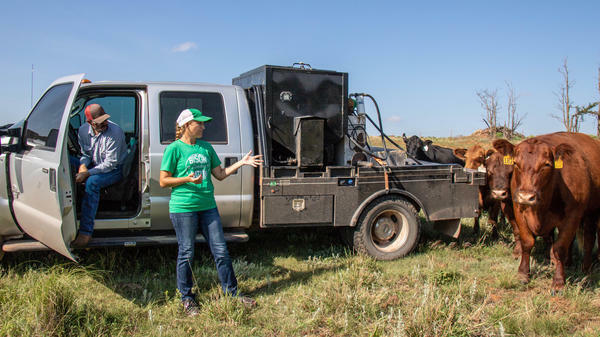 Benji and Lori White, the ranchers who live near the 99th meridian, know a lot of farmers who abandoned the industry after the drought that started withering Oklahoma in 2011 and left more than $2 billion in agricultural losses. "Cost of equipment, fertilizer, lack of rain — it's just hard to make it pencil out when you're trying to do it to make make a profit," Benji White said. The White family is all-in on cattle and Red Angus. The animals are hardy and sweet, and their red hide means they'll stay cool and stand a much better chance of growing big when the next drought comes. "With the cow-calf operation you have more options," he said. "I'm not that much of a farmer. I don't want to get that much bigger, and I think cattle is a little less tied to those commodity prices." Joe Wertz is a reporter with StateImpact Oklahoma.